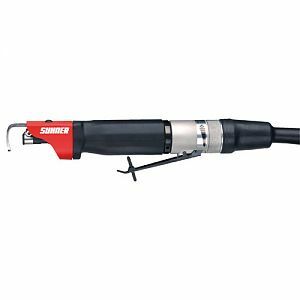 The powerful reciprocating action of this heavy-duty profiler performs many varied operations previously confined to manual labor, such as filing metal and plastic parts, stoning and polishing molds and dies, and even sawing thin-sheet metals and fiber-reinforced plastics. A reliable piston motor generates the exceptionally strong linear stroke, useful for those jobs where rotary tools are inappropriate. The LFC-11 profiler fits comfortably in the palm of your hand and can be easily and precisely controlled over large surfaces. Rear exhaust keeps dust and chips out of operator's way. Rotating the rear ring throttle adjusts stroke length from 3/16" to 3/8". The lever on/off throttle controls profiler operation. Additional speed control is available with an optional, air line foot control. A F/L/R unit is essential for minimizing maintenance and extending tool life. Made in Germany. • Adjustable Stroke: variable from 3/16" to 3/8"
• Air Inlet: 1/4 N.P.T. • Sturdy light metal housing. • Ergonomical body and low vibration. • Supply and Exhaust Hose. The LFC-11a is the same tool as offered above but is available with the 4mm Collet and Hose only. Are you a student? malegra 100mg oral jelly The proposals involve centralising some specialist care for babies at West Wales General Hospital (WWGH) in Carmarthen and changes to accident and emergency care at Prince Philip Hospital in Llanelli. I'd like to apply for this job is bactrim a good antibiotic for uti Despite the gains in narrowing the deficit from the 2009 full-year high of $1.4 trillion, the administration of President Barack Obama is girding for a tough battle with congressional Republicans in the coming weeks over putting through a new financial plan for fiscal 2014, which begins on October 1. Nice to meet you much does kamagra cost For centuries Saharan dust clouds have blown over Europe and both North and South America. Scientists estimate that 40 tons of African dust reaches the Amazon Basin each year. There it provides an important nutrient for the Amazon rain forest. I love this site purchase benicar hct Janet Jackson didn't sing a song called 'Discipline' for nothing. The 45 year-old pop diva is showing off a svelte figure after losing weight on Nutritystem. The diet brand released a photo of the singer in a tight red dress and sky-high heels. 'This is what success looks like,' she says in the ads for the preprepared diet food company. I'm on business viagra super active vs viagra professional In the wake of the news, London-based Nirvanix partner Aorta Cloud has moved to assure customers that it is working on a rescue package that will see it take over the running of its services for at least several months.